As the Chinese People’s Liberation Army (PLA) shapes itself into a “world-class force,” it is also modernizing its nuclear weapons stockpile. Keeping one’s nuclear deterrent in good repair, maintaining strict control, and clearly communicating its purpose is the mark of a responsible actor. China, however, is doing much, much more while keeping the rest of the world in the dark. Now, some observers even suggest China may abandon its longstanding “No First Use” (NFU) nuclear policy, which would signal China’s intent to stand alongside the United States and Russia as a nuclear power capable of inflicting destruction beyond ordinary catastrophe. 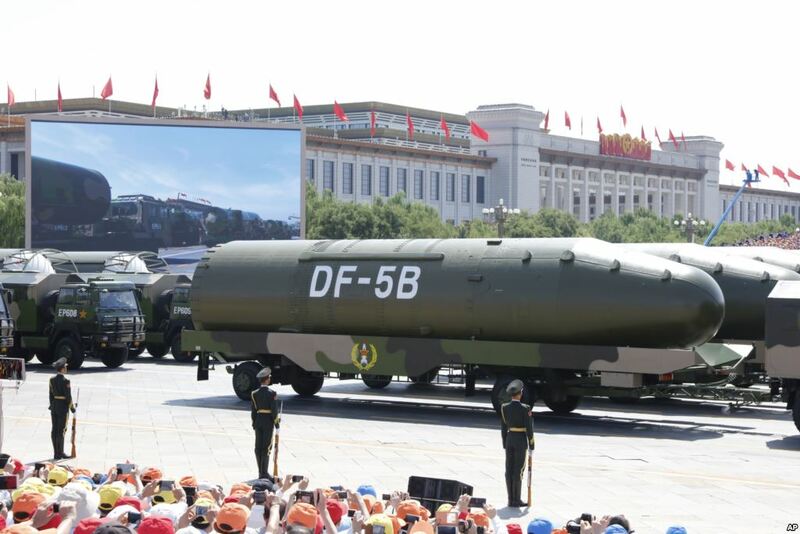 During the September 2015 World War II Victory Parade in Beijing, the PLA Rocket Force (PLARF) unveiled China’s DF-26 intermediate range ballistic missile, capable of delivering both nuclear and conventional payloads throughout the western Pacific. The PLA is further continuing to develop its DF-41 ICBM, which Western analysts suspect may carry multiple independently targetable re-entry vehicles (MIRVs). Furthermore, China is developing a sea-based nuclear deterrent with its Jin class nuclear-powered ballistic missile submarine (Type 094 SSBN). The PLA will begin building a new class of SSBN in the early 2020s: Type 096, equipped with the JL-3 next-generation submarine-launched ballistic missile (SLBM). China’s nuclear deterrent is also increasing in size: between 2015 and 2016, the U.S. Department of Defense reported an increase in China’s ICBM force from between 50 and 60 missiles to between 75 and 100. Xinhua in 2010 and again in 2013 reported China’s first successful tests of missile defense technology under what it calls Project 863. Although China’s air expeditionary capabilities currently lag those at sea, one wonders whether an air-based nuclear deterrent can be far behind. Although these advances are significant, particularly in light of stagnant U.S. defense spending, most striking is China’s de facto acknowledgment that its DF-5C missile is equipped with MIRVs, as reported by China’s official military newspaper. If China’s nuclear force remains the “countervalue” force that it claims — possessing only the capability to deliver a punitive second strike after another power has struck it - it has yet to explain why it is increasingly taking on the profile of a great nuclear power. According to Li, some Chinese strategists envision first use of nuclear weapons in certain situations: Taiwanese independence, attacks targeting China’s nuclear weapons or nuclear command and control, a conventional attack with force equivalent to a nuclear attack, and of course if faced with regime change. But are these questions particularly new or serious? I do not think so. Rather they reflect the ongoing internal debate about long-term issues. A good example of such a debate is China’s stance on North Korea’s nuclear and missile programs. China-DPRK relations were once those of normal allies. When China normalized diplomatic and economic relations with South Korea in the 1990s, however, it was only natural for some to wonder about China’s commitment to its ally. But it wasn’t until North Korea smashed the nuclear status quo on the peninsula that China brought this dispute out in the open, culminating in China’s willingness to punish North Korea. In contrast, China’s NFU policy is still in the second stage of questioning: the development of new technology is providing China some incentives to abandon the policy, but there has not been a crisis comparable to North Korea’s development of nuclear weapons to shift the debate in China. Until it occurs, I do not believe China will abandon its policy. Particularly operative in this respect is the fact that China is free at any time to abandon its policy and use nuclear weapons. Thus, unless it saw some indispensable deterrent effect of jettisoning NFU - for example to keep Taiwan from declaring independence, or to prevent the U.S. from supporting Taiwanese independence — China is unlikely to alter its commitment to NFU. China is, however, entering the realm of the nuclear great powers, previously limited to the United States and Russia, without the attendant controls, especially the MRBM treaty. As long as China refuses to take on the responsibilities of a great nuclear power — or make clear its status as a lesser nuclear power — its opaque policies will strain the status quo and become yet another area in which China has chosen to disrupt the international system. Ben Lowsen is a specialist in Chinese political and security affairs working as a China advisor for the U.S. Air Force’s Checkmate office. He tweets at @lowsen88. The views expressed in this post reflect those of the author and not that of the U.S. Navy, Department of Defense, U.S. Government, or EastWest Institute. The views expressed are his own and do not reflect the official policy or position of the U.S. Air Force, Department of Defense, or the U.S. Government.